A garden in which only toxic plants are grown – for show. It's part of a larger garden complex, but this section can only be visited on a guided tour (for obvious enough reasons). It's located in Alnwick in Northumberland, Great Britain. A very special site! 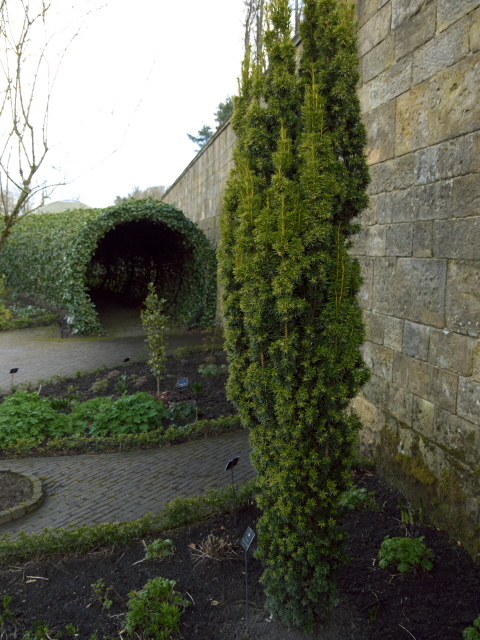 More background info: Alnwick's poison garden provides “a fascinating glimpse into the dark side of nature”, as it says in the guidebook you can buy at the site's visitor centre. And indeed, you can say it is a unique representative of what you might call the botany, or horticultural, side of dark tourism! Even though the guided tours' and the guidebook's narrative are full of ancient stories, folklore and mythology, the gardens themselves are actually fairly recent. There was a smaller garden at the site from around the mid-19th century, parts of which are now the ornamental garden part of today's complex, but it had long fallen into neglect and dereliction until towards the end of the 20th century when the Duchess of Northumberland (from the adjacent Alnwick Castle) took the initiative to revive and enlarge the gardens. This redevelopment was begun in 2001, and the poison garden was added in 2005. All of this was a major investment. Apparently it's the biggest new garden project in Britain since WWII. The land was donated by the Duke of Northumberland, who also contributed to the investment, but the garden is now run as a separate charitable trust. The Alnwick Gardens have become a popular tourist attraction of the region, probably second only to Alnwick Castle next door. 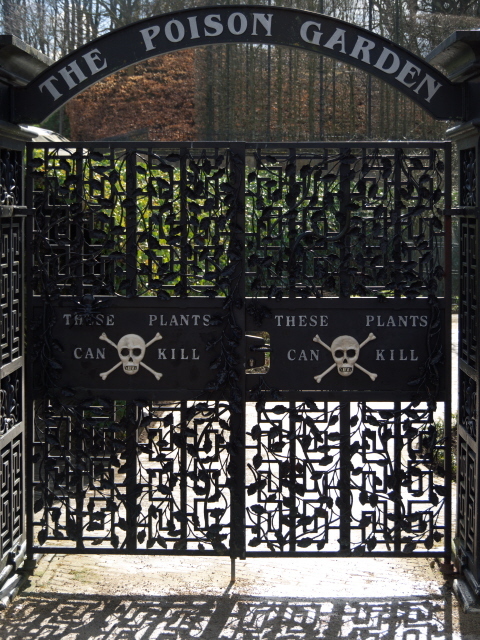 What there is to see: The poison garden has a fence around it on one side and a high wall on the other and access is only through a black iron gate which bears the very clear warning: “these plants can kill”, accompanied by a skull and crossbones. 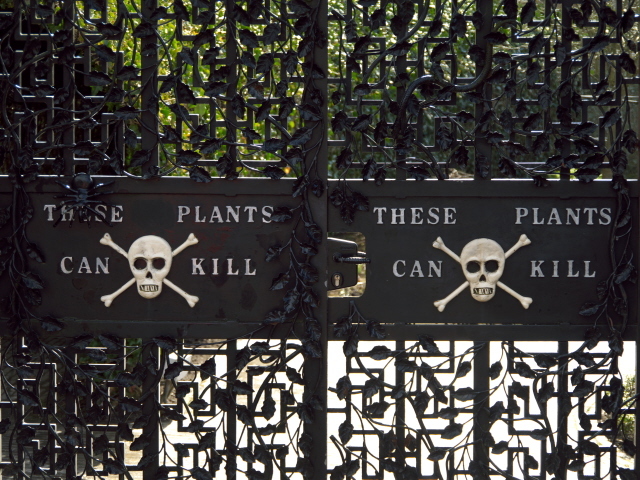 To get through the gate and inside the poison garden you have to be on a guided tour. They don't cost extra but you have wait outside the gate until your tour starts. If it's a busy day, you may have to stand in line for a bit. When I visited in March 2016 I arrived as one group was just leaving and I was able to get on the next tour, so it didn't take so long. While you wait you can peek into the little hut by the gate – it's like a little witch's house, full of bizarre artefacts arranged around a central fireplace, e.g. 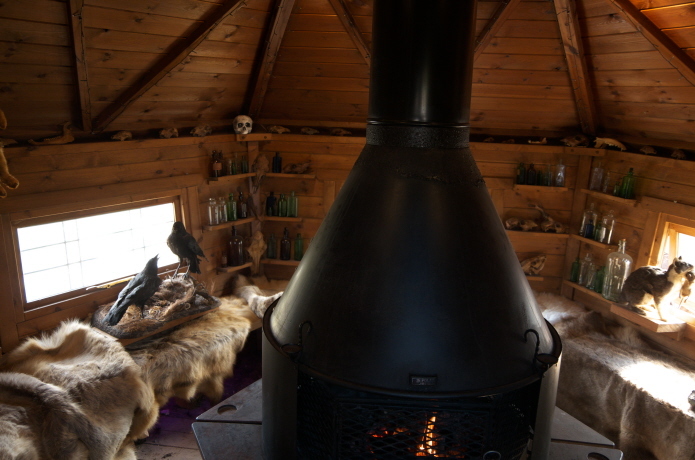 skulls, taxidermy crows and little glass bottles (of poisonous potions?). When it's your batch of visitors' turn for the guided tour, the poison garden warden will first give you a general intro talk. The main thing is: don't touch anything, let alone taste anything, and never stray from the group. But after those stern admonishing words, the guide's style of delivery, and even much of the content of what he had to say, was actually very entertaining and often funny. My tour began with an apology: as it was too early in the season we wouldn't be able to see some of the famous specimens grown here, in particular the drugs: cocaine, cannabis or opium poppy (and also the plant that kills more people than any other: tobacco). Apparently seeing these for real is very much in popular demand. So if that is important to you then better go at a later point in the year. The first plant that we stopped at was rhubarb. Yes, the common garden rhubarb. Now, I've never liked eating or even smelling rhubarb, but finding it here was still quite a surprise. Explanation: the red stems used for food are fine, but the leaves are toxic, in fact very toxic. All the more scandalous was the story that when rationing was first introduced in WWI and home-growing of food was encouraged, people were advised to use rhubarb leaves as a substitute for spinach. Only after several people had died was this fatally wrong governmental recommendation reversed! Amongst the other poisonous plants pointed out to our group was the legendary mandrake, or mandragora. No plant is steeped in folklore and mysticism more than this one. Allegedly the roots look like a man – with two legs and a hairy top (head), though in reality it can look just like an ordinary, parsnip-like single root . Legend has it that this man-shaped root screams when you pull it out – and that it is that scream that kills the person who did the pulling. In reality, however, the screaming legend was probably deliberately planted in the heads of people to prevent theft of the rare plant (which was prized as both an ingredient in medieval anaesthetics as well as an alleged aphrodisiac). Still, in many places the recommended or prescribed ritual of harvesting a mandrake root was to tie a hungry dog to the top of the root and then throw it a piece of meat from a safe distance so that it would jerk out the root … and if any deadly screams ensued they'd only kill the dog. Other toxic plants that featured on the tour were much closer to the real-life dangers posed by them to people today, especially pretty berries that children may be tempted to try – and if unlucky suffer the nasty effects. There were also plenty of stories of murder. And as it turns out the practice of poisoning as a murder method is very much preferred by women. That's not just ancient witch stories but actual contemporary forensics. But when the guide proceeded to say “and what do we learn from all this? Don't trust women!” he was of course only joking. Finally we came to what was introduced to us as the most poisonous plant native to the British Isles: the yew tree, all parts of which are lethal except for the berries (though – cunningly – the seeds are toxic!). The way its toxin kills when ingested is especially perfidious. While some may experience an increased heart rate and feel a bit sick, there can be no symptoms at all at first except great tiredness. But when the intoxicated person does go to sleep he or she would never wake up. If undetected, and untreated, the poisoning can kill within a couple of hours. Exactly what plants will be pointed out, and which stories associated with them get told, will of course vary with the seasons. This report covered just one example, from early spring. Tours will also vary with the guide you have (several share the job), but I found mine especially entertaining, with a deadpan, dry sense of black humour that was just up my street (although not so much for two kids in my group who at times looked genuinely terrified and hid behind their parents' legs). 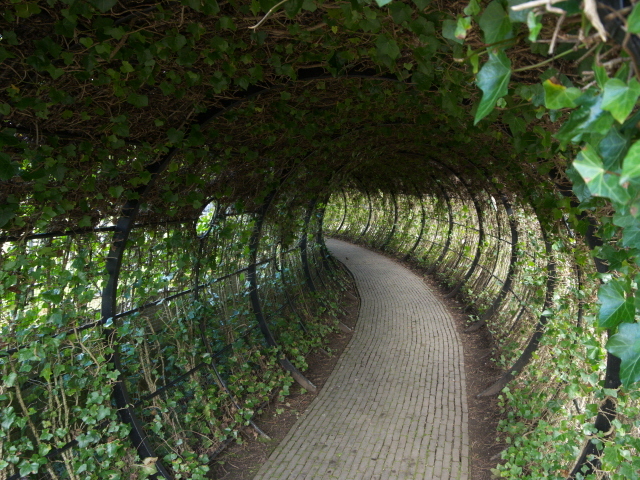 Apart from poisonous plants, the garden features two pretty tunnels of ivy, a bench with a plaque that noted a visit by the Prince of Wales, as well as two coffin sculptures. The first of these was actually a donations box – fitting and black-humoured at the same time. The other was an actual piece of art, featuring a man-shaped wire figure lying in a coffin-shaped bed of sorts. The guided tour of the poison garden felt to me like it was over in no time, though in reality it lasted some 20-25 minutes. That just goes to show how fascinating all these stories can be – and that's coming from me, i.e. from someone who is normally not particularly bothered about gardening and botany at large. This, however, was different. And good fun. The rest of the Alnwick Gardens are free from toxic plants, but there are other minor hazards, namely in the form of the water features in the ponds of the Grand Cascade. Some of these suddenly spring into action without warning and send spouts of water across the paved paths beyond. So unsuspecting visitors might get wet. Kids seem to love it, though. 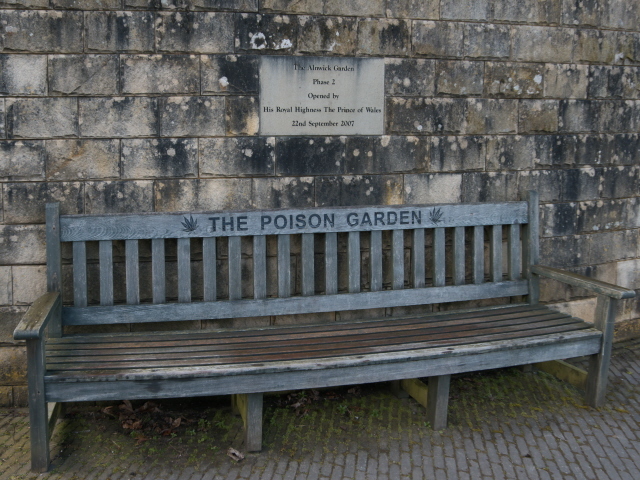 The large visitor centre and garden shop also has a section specifically related to the poison garden. Apart from the book about it, there is lots of gothicy style and witchcraft-themed stuff. Some items are rather on the kitschy side, others are actually quite beautiful. Location: at the eastern end of the main lawn that stretches out in front of the visitor centre of the Alnwick Gardens complex, in Alnwick, Northumberland, Great Britain. Access and costs: restricted (by guided tour only); not cheap. Details: access to the poison garden is by guided tour only. The tours as such are free but you still have to pay the general admission price for the whole Alnwick Gardens complex (i.e. you cannot just visit the poison garden separately or independently). The tours start roughly every 15 minutes to half hour – at least that was so when I visited in late March, when they didn't let in more than two groups at any one time. I don't know if they allow a higher frequency in the peak season, or if the queues just get longer. The size of the groups is limited too, I think it was 15 participants max. When I was there I just turned up and was simply allocated a space on the next tour (another one had just left). At busier times, so I've read, you can obtain a ticket at the poison garden's gate for a later specific time slot and come back for that, rather than waiting the whole time at the gate. Given the restricted access you'd probably have to factor in quite a bit of waiting time at really busy periods – and if you go too late you risk that there may not be any available time slots left that day. To get to the entrance to the garden from the town of Alnwick, walk up Greenwell Road, which turns off the main road (B6346) just outside the old Hotspur Tower on Bondgate, (a remainder of the former medieval town walls). Where the road bends west turn right and follow the pedestrian path past the ornate wrought iron gate and turn right again. The path takes you to the entrance, visitor centre and garden shop. The ticket booths are on the eastern side. You get straight to the ticket booths via a path from the car park east of the gardens, which is reached from the B1340 road that comes down from the northern exit off the A1 (see also under Alnwick). Note that parking is charged extra (at 3 GBP at the time of writing)! Admission to the Alnwick Gardens in summer (in 2016) is 12.10 GBP for a regular adult ticket if bought at the main gate. However, if you buy your ticket in advance online you get a 5% discount (you have to specify a precise date, though). The ticket price includes a “voluntary donation” of 10%, which allows the charity to claim back tax on it, but only if you are UK tax payer. If you're not, or if you simply don't want to pay an extra donation, you can remove that 10% during the online booking process. Prices out of the main summer season may be lower. Some concessions also apply and there are family package prices and annual passes as well. Opening times: daily from 10 a.m. to 6 p.m. in spring/summer (from 24 March to 30 October) – in winter only to 4 p.m. The poison garden is open daily too. Time required: The tours of the poison garden take only ca. 20-25 minutes, but you may have to allow for waiting time too, also if you want to see the rest of the garden complex you have to factor in extra time for that too – how much will depend entirely on your interest in gardens as such. I spent only about another half an hour there, but others can apparently while away hours here. Combinations with other dark destinations: see under Alnwick. Combinations with non-dark destinations: The rest of the whole garden complex is the most obvious combination, of course. I'm not much of a garden person so I can't really comment expertly on its merits or shortcomings. 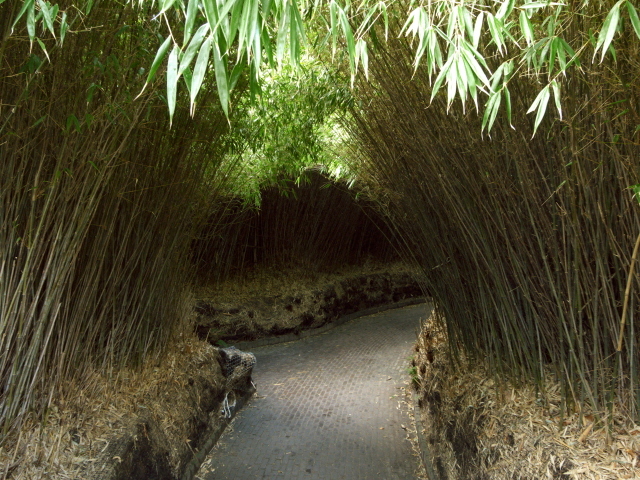 One other part I quite enjoyed was the bamboo labyrinth (maze), however. The water features of the Grand Cascade in the centre of it all are quite pretty. Otherwise I wasn't overly impressed. But as I said, that may just be me. Run as part of the garden complex is also the Treehouse – just beyond the eastern car park. They claim it is the largest tree house in Europe. It serves as a restaurant, which is said to be good. It is enchantingly different as a venue in any case. Unfortunately I couldn't check it out myself when I was there as it had closed early that day (maybe for some function). Bookings are recommended. You do not need a ticket to Alnwick Gardens to access the Treehouse. The local top attraction in terms of general tourism is Alnwick Castle, the grand seat of the Duke of Northumberland, reached on a path just to the west of the Gardens. While the private residence parts for the Duke and his family are off limits, other parts of the castle's interior can be visited (admission is steep at nearly 15 GBP, although online tickets cost 10% less and there are a few concessions; open from 10 a.m. to between 4 and 5:30 p.m.). For the rest of the town see under Alnwick and for everything further afield under Great Britain in general.